Ernest G. Simmelink, born March 5, 1921, Downs, KS. 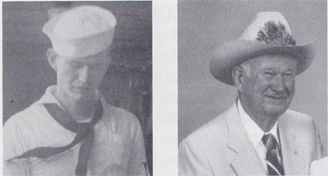 He joined the USN Jan. 1, 1940, and was assigned to the USS West Virginia and was aboard Dec. 7, 1941. He also served on the USS Medusa as a carpenters mate 2/c. His cousin, Jim Ryan, was on the Medusa too. In August 1944 he was sent back to the States and was assigned to the USS Tucson, where he finished the war and was in Tokyo Bay for the signing of the surrender. He was discharged Jan. 4, 1946. Received the American Defense, American Theater, Asiatic-Pacific w/3 stars. Good Conduct Medal, WWII Victory Medal w/star and Commendation Ribbon. He is a member of the VFW; past grand knight, Knights of Columbus; faithful navigator of the fourth degree, K of C; past Kansas State Chairman, PHSA, seven years, Order of Shellback 1940, Order of Golden Dragon, April 15, 1943 and again June 5, 1945. Married Tillie (deceased) and is now married to Mildred. He has three children: daughter, Marie Odle (deceased), son John, and daughter Lillie. He spent six years in Salina, KS and returned to the farm in 1951. He is still farming 2,000 acres at the age of 75. He also does television sales and service. He enjoys traveling and meeting people.